The USI Electric 5304L Hardwired Ionization Smoke and Fire Alarm responds quickly to fast-flaming fires to protect your family against deadly threats in the home. Perfect for new or replacement installations, this 120-volt AC hardwired alarm is suitable for houses, apartments and mobile homes. This hardwired smoke alarm is fully interconnectable with all USI and Universal 120V alarms using existing wiring and mounting. 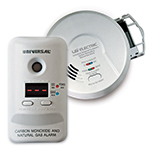 Quick Find alarm origination identifies the first USI detector to sound in an interconnected system and the single silence/test button temporarily quiets nonemergency alarms. The long life lithium battery backup (included) provides protection in the event of a power outage for the entire life of the alarm. 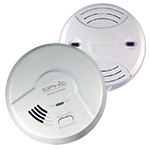 This hardwired smoke and fire alarm also features a quick activation pull-tab and a front-loading battery drawer for replacement without removing the detector from the bracket. Mount the bracket to any standard wiring junction box and use the large mounting base to cover imperfections in drywall. The plastic dust cover protects the alarm from debris and (2) tamper-resistant locks prevent unwanted alarm or battery removal. For maximum protection, install a smoke alarm inside every bedroom, outside every sleeping area and on all levels of the dwelling. House was built with USI interconnected smoke alarms installed. Time to replace them, so I chose the 5304Ls with the ten-year battery for convenience. Longer life batteries make maintenance easier. These were easy to install as replacements to Model 5204 Smoke & Fire Alarms, because of using existing wires & plug-in. Installed without any issues. No apparent defects. Would buy again. Very simple to install. The alarm replaced model 1204 and the base fits easily into the old ceiling fitting. USI has taken care to make sure the upgraded new devices can be used in the same location as the previous models. Detectors were ordered to replace expired units. Installation was straightforward. I ordered online, based on reviews and comments, the model I thought would replace my smoke alarms since they all went off at one time-my experience told me they had reached the end! Come to find out, I picked the wrong one! I called the company and they immediately advised the correct unit, placed the order for me and sent me RMA paperwork for return! All in just a few minutes! Wonderful customer service! I highly recommend this company! VERY NICE PRODUCT AND VERY PLEASED WITH ENCLOSED WIRING TO MATCH AND MOUNTING PLATE YOU REQUIRE FOR INSTALLATION.LONG LIFE BATTERY IS SUPER VALUABLE TO ENHANCE PRODUCT ! Shipped promptly, easy installation, works as advertised. This is the second time I have ordered replacement smoke detectors for our home. The replacement items have worked very well. No failures nor problems of any sort. Great products from a great company! Easy to install. Arrived in a timely fashion. It's a smoke detector with integrated charger and a rechargeable battery promised to last the life of the detector, which makes changing batteries obsolete. If it will last the 10 years as promised, it will be a great device! 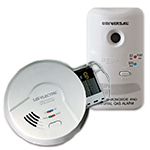 Excellent replacement for older alarm model 1204 to retain inter-connectivity with a 10-year battery life. Time to replace the 5-year-old alarms. These were perfect, brand-for-brand, with the added convenience of fitting the existing brackets! Very pleased with our recent purchase of smoke detectors. Order was processed quickly and provided in record time.